Synopsis: Finn Gramaraye was framed for the crime of dark necromancy at the age of 15, and exiled to the Other Realm for twenty five years. But now that he’s free, someone—probably the same someone—is trying to get him sent back. Finn has only a few days to discover who is so desperate to keep him out of the mortal world, and find evidence to prove it to the Arcane Enforcers. They are going to be very hard to convince, since he’s already been convicted of trying to kill someone with dark magic. 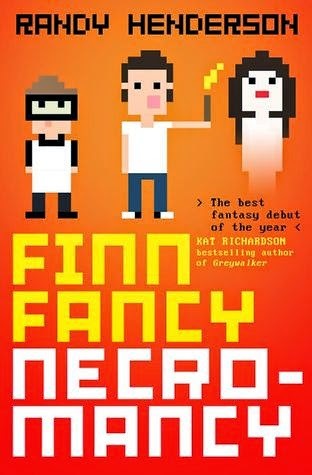 Review: I think we can safely rename this book Finn Fancy Fun Necromancy (not that Finn needs any more nicknames adding to the list), but this book was a bit of fun. I read it over the weekend and it was the perfect journey book, swept me in, kept me going and had me suitably entertained. The action takes place over a few days, and as such the world is built as you go long, so you're constantly learning and adding things to build up the framework, This worked for me because everything wasn't set in stone, or pre-determined , so I got to experience a different side of magic and the occult. It was also nice that every character had a different role to play in this; you had enforcers, with their lightsaber-ish batons, Finn with his talking ability, Heather and her alchemy...even Sammy with her allergy to magic all banded together to create something fun, and something modern and I liked that fresh element of a modern setting. I loved all of Finns references and his own learning curve having missed out on 25 years in exile (not a spoiler its on the cover) and the way in which he still had that connection to the past, including full on Shatner nerd out was a nice character touch, especially since he didn't feel like the fifteen year old he was sent away as. Zeke's constant use of 'Fool' made me think Mr T was in the book, or maybe that's just the way I read it...that's how other people read it too...right? Right!? It added something either way aha, as did his choice of clothing and hairstyle. These were the little things (G-mail anyone) that gave the book some punch and made it an enjoyable read. Great début, especially if you like a bit of fantasy, hoping to read more of this author in the future!